Kaine will be celebrating their first decade with a night of Heavy Metal at Colchester Arts Centre. Included with the price of VIP tickets will be a live album on CD/Digital Download recorded on the night by Colchester’s very own Pioneer Music Studio, the event t-shirt, poster and more to be announced and given away at the show. 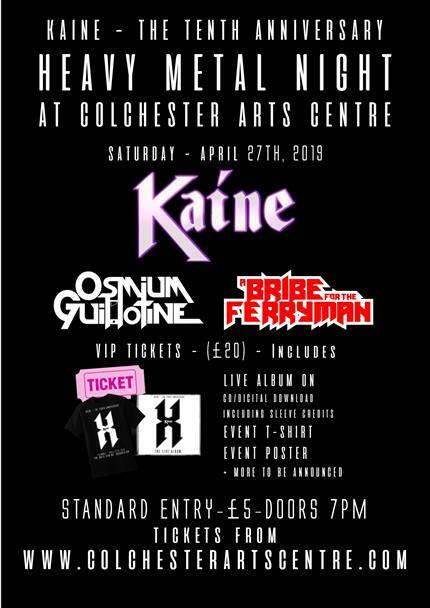 Kaine will be joined by fellow local Metal acts Osmium Guillotine and A Bribe for the Ferryman for a celebration of live, local, heavy music in Colchester at one of the best music venues in the country. Kaine’s set will include guest appearances from founding members as well as a final collective appearance from the line-up which recorded the A Crisis of Faith album.